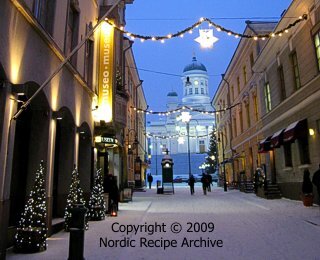 Compared to Finnish Christmas, which is traditionally spent quietly among family and relatives, the celebration of the New Year in Finland is a more boisterous event. 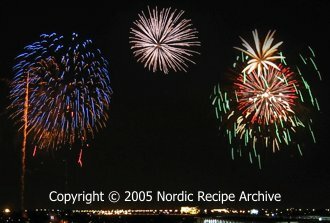 An essential part of the Finnish New Year's Eve festivities are the numerous fireworks displayed throughout the country, being the highlight of the evening. Most of these are consumer fireworks, fired by private citizens. Professional fireworks displays are sometimes conducted by many towns, organizations, clubs or companies. In wait of the midnight, many people spend the evening celebrating with their family and friends, either at home or attending the numerous New Year's parties in restaurants and nightclubs. Others may spend the evening comfortably at home, watching the colourful fireworks cracking across the skies outside, starting as the midnight approaches. Also more formal gala dinners, concerts and balls, requiring a booking well in advance, are organized by many restaurants, clubs and organizations. When having an informal New Year's party at home, usually a smörgåsbord, the Nordic buffet table, is set for the guests, consisting of simple hot or cold dishes, snacks and desserts with coffee and tea. Besides eating, some entertainment may be arranged for the party, like games for kids or making of New Year's resolutions for grownups. Any pastime activity is especially appreciated by children, who are eagerly waiting for the highlight of the evening, the fireworks display. At midnight, people usually pop outside in the crisp winter night to fire or just watch the fireworks fired by others. Glasses of champagne or sparkling wine are raised to make a toast to the new year ahead. After midnight, if the evening will yet continue, it is a good idea to have a late night snack with hot drinks waiting for the hungry guests. See a suggestion for a New Year's Eve menu here. 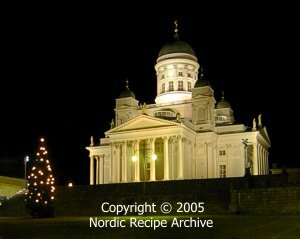 The main event of the Finnish New Year celebration is held in Helsinki, the capital of Finland, where people gather in the Senate Square, one of the central squares of the city, to attend the national New Year's Eve ceremony. Nowadays, after the clock has struck twelve, the event takes on a more relaxed and frivolous tone, as the people gathered on the square are celebrating and wishing each other a happy New Year, with toasts of champagne or sparkling wine. In some years, also the Senate Square event culminates in a fireworks display arranged by the city or some other organization. Although firing of consumer fireworks is forbidden on the square, one should be aware of the numerous drunken people firing them in the crowd, regardless of the ban. Similar to Midsummer night, New Year's Eve has traditionally been the time for fortune telling and predicting of the future. People have tried to secure a good fortune for the coming year or get a glimpse of the future events by performing various magical tasks and tricks. Some of these tricks have remained until our times as an amusement and games practised for fun in New Year's parties. One of the most popular tricks performed is the casting of tin. 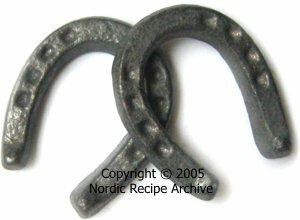 Everyone gets a small piece of tin, cast in the shape of a miniature horseshoe, a traditional symbol of good luck (see the picture on right). The horseshoe is melted and the liquid metal poured quickly in a bucket of cold water, making it harden into a more or less irregular-shaped, solid clump. The shape and shadow of the resulting cast are examined and interpreted to predict the various future events of the coming year. Different shapes have different meaning, promising either good luck or health, wealth, happiness, sorrow, sickness, etc. If the cast breaks down to pieces, it is a sign of "bad luck". Another popular game for "predicting the future" is to place various small objects under cups or plates turned upside down. The persons attending the game lift one cup at a time, revealing the object hiding under it. Each object has a special meaning, symbolizing things like love, happiness, wealth, sorrow, pain, or even death. When children are to lift the cups, the objects symbolizing grave and sad things, like sickness or death, are removed, in order not to frighten them. Sugar cube = easy living, "sweet success"
Empty cup = "nothing special"
The meanings for the various objects above derive from the old, agrarian society, and some of them are of course pretty outdated, at least in the modern western world  like the piece of yellow yarn being also a symbol for having an illegitimate child. You can bring the game more up to date by making up your own, more suitable meanings for the various objects. Pictures of the objects may also be drawn on squares of paper or cardboard, scrambled and placed facing down on the table to be lifted up one at a time, to see what the future will bring. 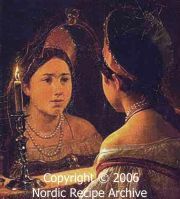 In picture on right: detail of "Svetlana guessing on her future" by Karl Briullov (1799 - 1852). If a girl wets her scarf in the water into which the melted New Year tin was cast and places it under her pillow for the night, she will see her future spouse in a dream. (The same goes for boys and handkerchiefs.) A coin can be placed under the pillow instead of the wetted scarf/handkerchief. 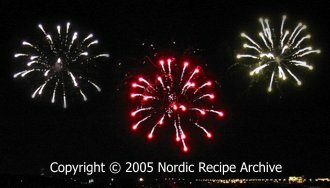 You will find recipes for dishes suitable to be served on New Year's Eve here.